Tagged agricultural biomass, Agriculture, Bagasse, biofuels, Biomass, Biomass Energy, biomass energy in Philippines, Biomass in Philippines, Coconut, cogeneration, Crop Residues, Husk, Philippines, Rice, Sugar. Bookmark the permalink. Nice review of an emerging biomass market to Asia. Philippines can certainly be a sustainable supply chain for biomass energy and animal feed. Viaspace Inc I understand is reviewing opportunities for their Giant King Grass. Thanks Salman! Gud day! Is this project possible for smaller community or baranggays whos far from the city? Thank u.
Biomass energy projects can be of small, medium as well as large capacities. It can definitely be tailored for a small community in the Philippines and elsewhere. 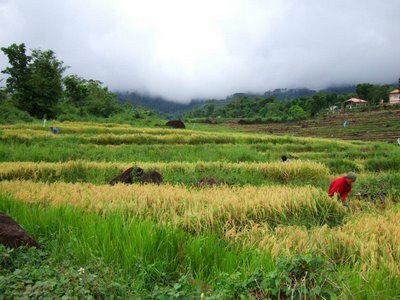 It was stated that “Rice hull is perhaps the most important, underdeveloped biomass resource that could be fully utilized in a sustainable manner.” Why is it still underdeveloped? What are the hindrances? Biomass potential is higher: 16 million tons is what is dumped for the larger part. Excluded is rice straw (burned in field, although not allowed), reject wood, sawdust, from clearings etc. Main points that it isn’t getting developed: a. transport (only trucks and small roads); b. central grid instead of distributed (co)generation, c. very low mechanization grade and antiquated processing facilities. Thank you Salmon,you have been educating us so much in your blog,i’m interested in partnering with you as introducing agent in Nigeria. We can introduce you to lots of intending investors in Nigeria as consultant for the projects of bio energy where we have a lots of intending state,,local government and private investors willing to go into the industry. We will appreciate partnership relationship with us in Nigeria where there is more abundant opportunities for both of to benefits. i.e Training,&consulting services.